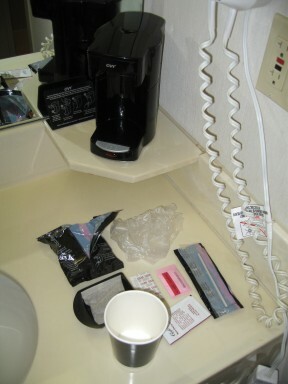 This is the coffee-making apparatus from the hotel room in St. Louis. Note the waste associated with brewing a single cup of coffee. I can understand the need for ensuring the hotel-room coffee-maker is clean, but I mean, this thing still has a water reservoir, so what’s the point? I guess I just feel like after the whole “we don’t wash sheets every day” thing, this is a big step backwards.